Do you need an engaging listening activity your high school learners could relate to? This listening activity is ideal to make students reflect on their own behaviour and learn more about the reasons why teens generally act the way they do by watching the video titled: The Teenage Brain Under Construction (clickable YouTube link is provided). There are two versions included in the document: a special Valentine’s day edition and a listening worksheet you may use all year round. This listening activity is not only useful to develop listening skills, but it is also a nice way to bond with your learners by showing them that you are aware of what they are going through during these difficult teenage years full of changes, new experiences, self-discovery, ups and downs, trials and errors. This resource is more appropriate for upper-intermediate/advanced ESL learners. It may also be useful for ELA learners. Because we teach high school learners, we should not forget to celebrate Valentine's Day. 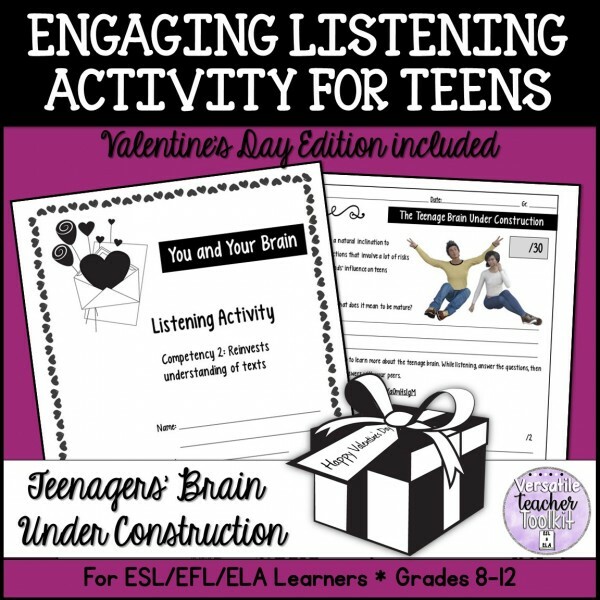 Use the Valentine’s day edition of this listening activity around Valentine’s Day to let students learn more about their emotions (e.g. intensified feelings, moodiness, dealing with feelings they experience for the first time, etc.). I am sure most of your learners will relate to this video as mine did. While listening/watching, learners will answer some listening comprehension questions. After listening/watching, there is a writing prompt that requires students to reinvest information from the video. As an optional task, you can ask students to work in pairs to peer evaluate each other’s writing and/or discuss what it means to be a teenager (pros and cons). as an emergency sub plan. a listening activity to develop learners’ listening skills. or simply use it as a plan B when you do not feel like planning for the next class. Resources may be in a zip, PPT or PDF file. Please make sure you can open these files. Pages are US Letter size format (8.5 x 11). Before downloading a product, read the product description and check out the preview document to determine if the resource is appropriate for your students. If you still have questions, do not hesitate to contact me. I would highly appreciate your feedback as it helps me improve and create better resources. All rights reserved K. Cana. This resource is for personal and educational print purposes only. You may make as many copies as you need for you and your own students only. The document may not be shared, uploaded or posted on any kind of websites/blogs or distributed and sold as your own work.